Born and raised in Sydney, Dean first took an interest in photography in 1974 at the age of twelve, when he acquired his first camera, a Petri TTL 35mm SLR. The building of a permanent darkroom immediately followed, and the years between 1974 and 1989 (punctuated by the arrival of a Voigtländer VSL 3-E in 1981) were spent shooting and developing B&W prints, mainly on Ilford paper. 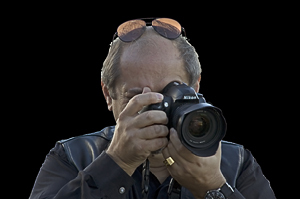 Taking a break from serious photography for a little over a decade, he leaped back into the passion after purchasing his first digital camera in March of 2002. Urban scenes and abstract works have always been in the repertoire, but a love of the Australian outback (sparked at the age of seven, living for eighteen months in a country town called Peak Hill, located between Dubbo and Parkes in NSW) and the acquisition of a Toyota Land Cruiser in late 2002 compels him to travel to relatively inaccessible and undisturbed regions of Australia, to photograph scenes that highlight the loss of beauty that we have suffered in the name of “progress” while we build bigger and noisier city living environments. Dean is a member of the Toyota Land Cruiser Car Club in Sydney, and gained his VETAB accreditation after taking his driver training at the club's Willowglen training ground, near Goulburn. As a result of spending an increasing proportion of his time out in the bush, trying to make the clinometer on the dashboard read "TILT! ", it is fair to say that landscapes are starting to form the bulk of his work. A firm advocate of digital imaging technologies, Dean uses a digital SLR and prints all his images on archival papers using pigment-based inks. "The longevity for digital printing media is now no longer second-rate compared to traditional photographic media, so you don't have to apologise for it any more. It offers me a degree of control which is difficult to achieve using wet print techniques. This is not to say that there is no place for traditional silver halide photography; it's just a different workflow. I don't buy the argument that film is dead because of the advent of the digital age - that's rubbish. I simply don't have the space any more for a permanent darkroom, and digital allows me to produce fine-art quality images without the need to set up and tear down. At the moment, I push all my output through a pigment-based inkjet printer and the output technology is, as far as I'm concerned, basically 'there' in terms of quality and permanence, so what I'm finding to be the limiting factor now is purely the camera I'm using."